The Bear Mountain Bridge crosses the Hudson River south of West Point. It is part of U.S. Route 6 and 202. 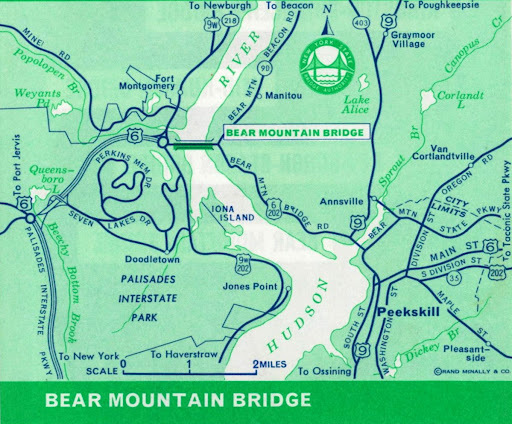 The Bear Mountain Bridge is a direct connection to Bear Mountain Park which is a major recreational area in southern New York State. 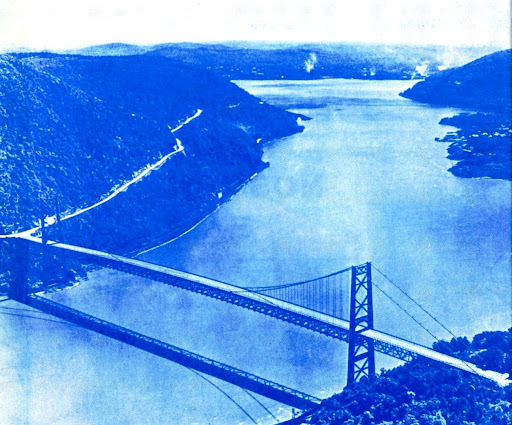 Bear Mountain Bridge is 2,257 feet long and was opened to traffic November 26, 1924. 1. Stony Point Battle Reservation: Here General “Mad” Anthony Wayne stormed and captured A British post. Historical Museum of interest. 2. 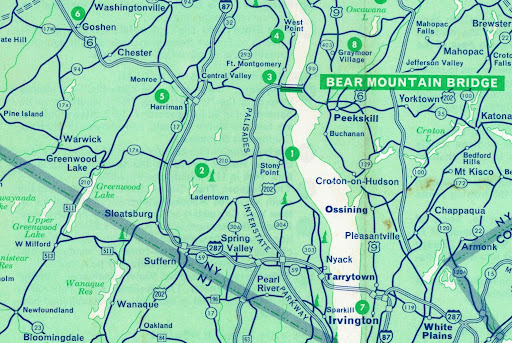 Bear Mountain and Harriman State Parks: Perkin’s Memorial Drive to the top of Bear Mountain, offers sweeping panoramas of the Hudson River and the Highlands. Complete recreational facilities for all outdoor sports are available. 3. Forts Clinton and Montgomery: These two forts were part of a historic plan to defend the Hudson River against the British fleet during the days of the Revolutionary War. 4. West Point: The U.S. Military Academy was founded here in 1802 to train officers for the Army. On a hill dominating the 16,000 acre reservation is Cadet Chapel. Restored Ft. Putnam, Battle Monument, Trophy Point and the Plains are of interest. 5. Monroe: Old Museum Village of Smith’s Cove is a historical enterprise-it has almost endless variety in the thousands of items shown in more than 20 buildings. 6. Goshen: The Hall of Fame of the Trotter is a museum dedicated to harness racing, over 100 trotting prints by Currier and Ives. 7. Tarrytown: In the area are Sunnyside, home of Washington Irving; Philipsburg Manor, home of F. Philipse, built in 1683; and Dutch Reformed (Sleepy Hollow) Church, recently converted into a Nat’l Historic Site. 8. Graymoor Village: Of interest is the Motherhouse of the Franciscan Friars of the Atonement. This entry was posted in Bear Mountain, Bear Mountain Bridge, Fort Clinton, Fort Montgomery, Goshen, Graymoor Village, Harriman State Park, Hudson River Crossings, Maps, Monroe, New York State Bridge Authority, Tarrytown, USMA West Point on June 19, 2012 by hudsonvalleygal. EVERY man ought to have a reason for his existence. If he has not he is only so much cumbersome matter in the way of society. He is eating possibly good food that ought to go to some useful person or occupying space that ought to be allotted to another. Every town ought to have a reason for its existence along the same lines of argument. Some towns are just towns and that is all. Their building was perhaps the result of land boomers to begin with and their existence is of little consequence. They have no reason for their existence. On the other hand some other towns have innumerable reasons why they exist and why they continue to grow. There are certain important facts upon which a town must grow and these must constitute its reasons for existence. First, the geographical location of the town must be logical. It must be on a line of trade and commerce. Second, the town must be healthful. It must have good drainage. It must have abundance of water both for its people and for its industries. Third, it must have the right sort of environment. There must be a farming, or trading, or resort country behind it. Fourth, it must have good roads and good transportation facilities. View from Bear Mountain, with Iona Island in foreground, Peekskill in the distance. These are the great essentials, the great natural essentials, that a town must have. If it, perchance, have other attractions, so much the better, but it must have these fundamental reasons for its existence and its hope to grow. Peekskill has these essentials. 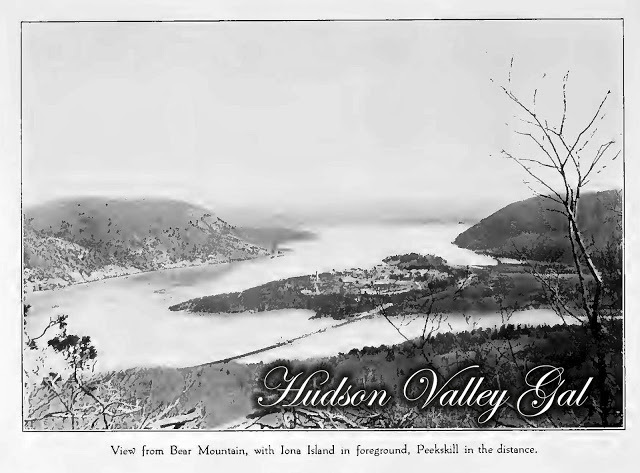 Peekskill was built on the site of an Indian village. The Indians had chosen the site because of its desirability. 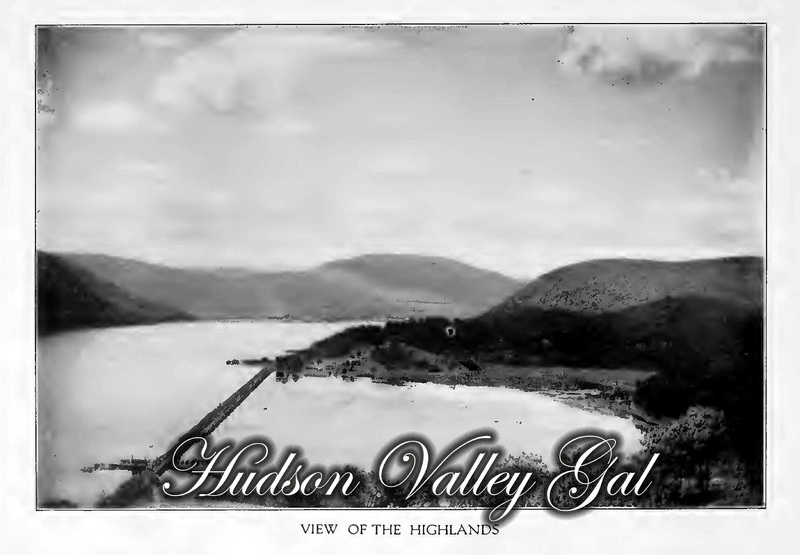 There were the hills sloping up from the Hudson—healthful hills, good for drainage, sightly hills from which the grandeur of the Highlands stood forth through the four seasons of the year. 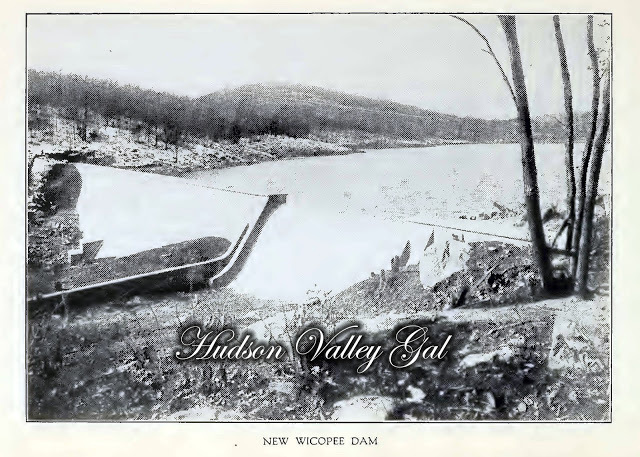 The Hudson River was right at hand for transportation by canoe or raft. Out of the rocks gushed the living waters, copious, abundant, refreshing. Is it any wonder the Indian chose such a site for his village? Is it any wonder the early Dutch settlers followed his example and loitered to build their homes on these unsurpassed hills? Those times are long sped but the reasons for existence are here in Peekskill today in even greater force than then. We have laid out miles of streets, have paved them, lighted them, filled them with water mains, gas mains and sewer pipes, with telephone conduits and with trolley tracks. We have brought all the elements of high civilization to the very doors of our people. We have builded schools that are a pride and a satisfaction to behold. We have offered all the inducements of comfort and convenience—and here is Peekskill, with a reason for its existence. Geographically, forty-one miles from New York City on the Hudson River Railroad—forty-one miles, just a nice ride out of the city yet far enough to escape all of its unpleasant features and to get the quiet of the country. Boats going north and south add to the facilities for travel and shipping. Physically, high and dry, no swamps or meadows, hence no mosquitoes. Drainage good, hence no fevers. The water supply of Peekskill is its great asset. The village owns the watershed and the pump works. The water is cheap and there is enough to supply ten Peekskills. This is a peculiar advantage—peculiar to the location. Watersheds can-not be purchased at will at a department store. Water is only where you find it and no town can grow without water. This one reason, if no other, makes Peekskill a good investment. If we go into the realm of sentiment, there is where we shine. Who wants to look on any better scenery than the Hudson River at Peekskill? People come across continents and over seas to travel on this famous river and see the self-same pictures that we enjoy daily from our porches. A sharp bend of the river forms a wide bay and Dunderberg, on the opposite side, looks majestically over at the thriving village. Just beyond the village Annsville creek empties into the river and across the creek is the State Camp of Instruction, now used mostly as a rifle range for the state soldiery. 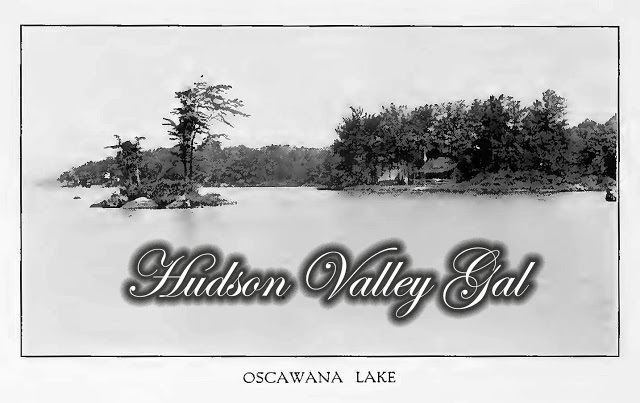 To the east and north of the village is the lake district of southern New York not to be excelled anywhere for beautiful scenery or attractive outing grounds or summer home sites. Oscawana, Clear, Indian, Mohegan, Osceola, Mohansic are a few of the nearby lakes and there are innumerable smaller yet beautiful bodies in the neighborhood. 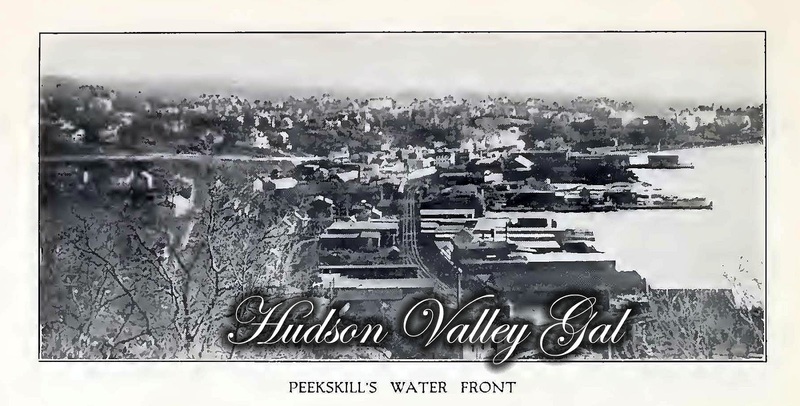 A village form of government has advantages, Peekskill believes, over the city form and in that belief it has remained under the former form until, with a population of more than 16,000, it is known as the largest village in the country. The President of the Village and Board of Trustees receive no compensation other than the honor the position gives and with such management Peekskill has moved steadily forward with a natural and healthy growth. Not rapidly but surely has it taken on the advancements of modern life and so it has never had reason to take a step back in its progress. One of the later municipalities in the county to have a trolley, its electric road is run more regularly than most in the section and a person posted as to the schedule time of the cars may set his watch by them. The same exactness may be seen in the gas and electric lighting and power service. The same holds true of its municipal constructions. Its streets are well graded and miles of them are paved. Its sewerage system is excellent. Its schools—private and public —are of the highest standard and the buildings, especially those of the public schools remarkable structures, perfectly fitted for their purpose and also striking examples of architecture. Every normal requirement is met and provided for. There are churches of nearly all denominations and these are situated in different sections, making it convenient for one to reach a place of worship from any district. Of hotels and theatres there is a good supply and the industries of the place are varied and numerous. A manufacturing village, its industries are numerous and include the manufacture of stoves, ranges and heaters, underwear and dress goods, automobile parts, machines and engines, oilcloth, hats, cigars, yeast, vinegar, whiskey and liquors, fire bricks, charcoal products, bricks, cement blocks and reconstructed stone, besides planing mills that supply all local demands. Newspapers are plentiful and from some of the presses of Peekskill are turned out excellent specimens of typographical art. Vacant land is abundant about Peekskill. In the residential sections many fine sites may be secured and especially is this true of the suburbs where homes may be had with large or small tracts of land, all quick of access to the business section. Industries are welcome, and in the suburbs and along the water front are most attractive sites for manufacturing plants. In this connection the reader will find elsewhere mention of Verplanck’s Point, which is now regarded by many as Peekskill’s prospective manufacturing center, and which has been long the home of the brick manufacturing industry of the section. This entry was posted in Bear Mountain, Gems of the Hudson, Peekskill, Westchester County on June 4, 2012 by hudsonvalleygal.